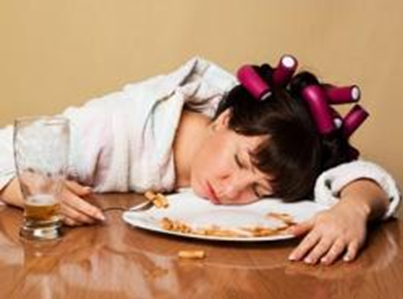 Going to sleep or napping after eating is very common because being full can make you drowsy. Many people think it is unhealthy to go to bed soon after eating and they will often go walking after a meal to help aid digestion. Discover if sleeping after eating will cause weight gain or if it is okay to go to bed after a meal. Many people feel the urge to take a nap after they’ve eaten because their bodies are working hard to digest the food they’ve just consumed. After you’ve eaten, your brain directs blood away from all the organs to aid digestion. In addition, red blood cells help digest food so it can distribute nutrients throughout your body, which further deprives your brain of blood, making it feel tired and leaving you wanting to go to sleep. Will Sleeping After Eating Make You Fat? No, sleeping after meals will not necessary make you fat. While it may seem like eating before bedtime would lead to weight gain because you are not burning off the calories you’ve consumed. However, it really doesn’t matter when you eat as long as you don’t eat more calories than you burned off during the day. You will gain weight if you eat more calories than you burn off. Though sleeping after eating would not cause weight gain, it is still not a good idea to do so. After eating, your body works hard to digest the food you ate and this can cause problems with indigestion system.According to studies done at the Massachusetts Institute of Technology, there are several reasons you should not go to bed after eating a meal. While lying down may feel good after consuming a meal, it can make heartburn worse and prevent you from sleeping well. Heartburn is caused when excess stomach acids spread from your stomach and up into your chest and/or throat. This can lead to belching and you may be able to taste something sour in your mouth. Acid Reflux is also referred to as GERD, which is short for Gastroesophageal Reflux Disease. This occurs when the valve located between the stomach and esophagus does not close all of the way. The acids in your stomach can back up into your throat and make it feel like it is burning. If not treated, the acids can damage the mucous membranes in your throat and lead to further complications. According to a study conducted in Greece, sleeping after eating may increase the risk for strokes. The study done at the University of Ioannina Medical School included 500 participants; 250 people had a history of previous strokes and the other 250 had been diagnosed with acute coronary syndrome. The results showed people who waited the longest to go to bed after eating were less likely to have a stroke. There are several theories about the results. Some thought because acid reflux is linked to sleep apnea that it could lead to a stroke. Another theory said since the body was hard at work digesting food, the changes in blood sugar, blood pressure and cholesterol when sleeping after eating could increase the risk of strokes. When Can You Go to Sleep After Eating? As it can take two to three hours for food to digest, try to stay up at least two hours after you’ve eaten. After your food has digested, you may be able to sleep better and your body is less likely to store food since it has been burned off. Studies have shown that smoking one cigarette after you’ve eaten is like smoking 10 cigarettes at other times, which can increase your risk of getting lung cancer. Taking a shower or bath after eating can lead to digestive problems. Bathing causes an increase in blood flow to the body, hands and legs, which takes it away from digesting your food and weakens digestive abilities. If you want to take a shower, 40 minutes after your meal is ok.
Fruit is easy for the body to digest, so it should be eaten an hour before or two hours after a meal If you eat fruit with a meal, you can become bloated. Drinking tea should be avoided an hour before and after a meal because the acidity of the tea can make it harder to digest food. Tea acids can harden proteins, making them harder to digest and they can also keep your body from properly absorbing iron.